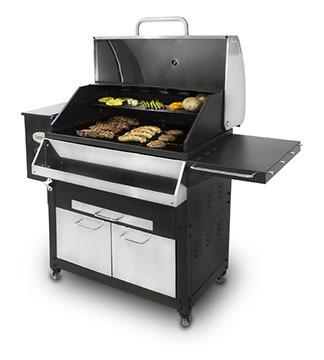 Removable Upper Cooking Rack, Digital Control Center with a built-in Programmable Meat Probe, Flame Broiler for direct/indirect grilling, 14 lb Capacity Hopper (extension available), Fits (1) Deluxe Front Shelf & (1) Side Shelf Extension (each sold separately). 800 Model Includes: 12 lb Capacity Hopper, Front Tray, Side Shelf with Tool Hooks and Bar Handle, Locking Caster Wheels, Swing-open Cabinet Doors for storage. Made of Stainless Steel Construction.